Thanks for your nocturnal e-mail, for every single word. We had a big meeting in the helmholtz-center yesterday night, it was on the occasion of fusing four institutes into a Department of Radiation Research. It was a big reception, but it was very political (what is not my favorite). I came home quite late, and the more I was happy reading your mail. Recently I thought of you, when I watched an old hollywood-movie, “Anna Karenina” from 1935. It was re-filmed since then many times, but none of the newer versions (like the recent from 1997 featuring Sophie Marceau) came close the early one from 1935 with Greta Garbo (I think it is considered among the top 100 important movies of cinematography). I don”t know if you (after Breakfast at Tiffanys) are willing to watch another old movie, that is even 20 years older. Greta Garbo (also nicknamed “the great Garbo” or the Divine”) reminded me of you, how she arrived in the movie the first time, through the steam of the train. She had the same extraordinary expression in her eyes and her face as you have, a sort of enigmatic aristocracy, as if she came from another world. What is a funny coincidence: her real maiden name was Gustafsson, so maybe she was a relative to Lars Gustafsson. I think I have to ask him. Or do you think, that Gustafsson is a too common name in Sweden ? But Greta Garbo (former Gustafsson) did not looked typical swedish, for my feeling she looked more oriental or south european. And before going to Hollywood, she lived in Stockholm. I hope you don”t mind that again I tell you things you have not asked me about. I hope you are well up, that you fill your days with pleasure and your nights with exciting dreams. I did not know that Greta Garbo was such an international star. 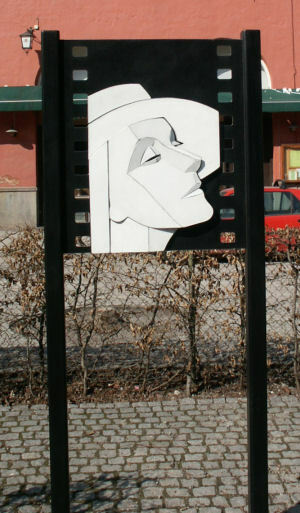 I remember that, quite often when we went to the center of Stockholm with my family, we passed along a little memorial that show a very pale face, and this was commemorating Greta Garbo. To be honest, I never watched a movie with her, but my parents told me that she was a famous swedish actress of last century. But it was a long time before I was born. And on the memorial plate she looks a bit sad and cold, so I was never tempted to see her acting in a film. But I like the short scene from “Anna Karenina” that you send from youtube, where she arrives by train and suddenly appeares through the steam. Do you know that, when I arrived the first time in Unterschleissheim by train, and you met me there to help with my luggage, I was feeling the same ? I had many doubts, I felt lonely and was afraid to be on my own for the next month without my parents. It was good that you came to meet me, not just to carry my suitcases. Platforms and trains are always the same, does not matter whether in Russia 100 years ago or in Munich in 2010. They all give you this impression of arriving at an unknown, hostile place, but later you stand there again on the same platform and have to leave this place, just when you got comfortable with it. That”s strange: when I watched the movie recently I somehow knew that it was not just Greta Garbos eyes and the expression on her face that reminded me of you. I could not tell where this strong feeling of a deja-vu came from. But now you gave me the solution, Ghazal. It was the very scene when Greta Garbo (aka Anna Karenina) arrives by train and she and Wronskij see each other for the first time, and both are like struck by a lightning. Now I know it was very much like the day in May when you arrived here, and I was waiting for you on the train station. I probably was shivering, when I saw you leaving the train, while Wronsky in a typical soldiers manner looked more frozen to a stone statue. When you said that you did not felt very confident about the project in Munich and how to live here on your own for 6 month, I tell you one could not recognise these doubts on your face. You looked very aristocratic, as usual, very calm and confident. But only later I understoud how experienced you are in hiding emotions.